Honestly, it's bigger, way bigger than the skein was! I am doing wash later today, and will chuck it into a load, since I knit rather loosely with cotton, and plan on a hot water wash and hot drier to shrink the cotton and make the fabric thicker. 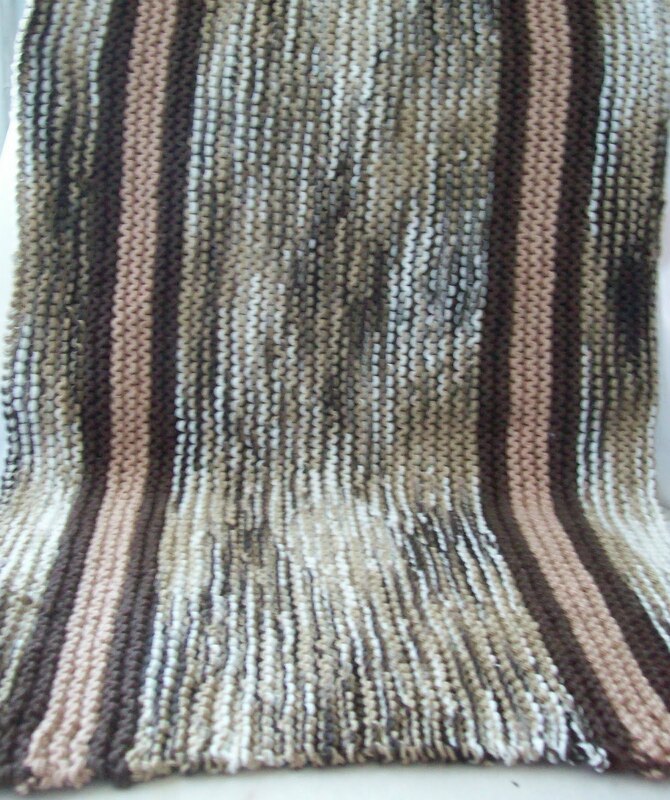 Not that it isn't thick now, but I know it will be denser once it has been washed and dried. It's pretty , too (though, how pretty does a bath mat have to be?) --and large enough (my bathroom is close to being the minimal size you can have and still have a sink, a tub and toilet. (The sink isn't even a pedestal style, but a wall hung one..and the basin is very small (I can't use it to wash my hair, and it would be too small to wash 'smalls” (undies and such) except 1 at a time. I do hand washing in a basin in my kitchen sink (which is HUGE)--It looks strange because is draped in a fold (almost as if it was seated. 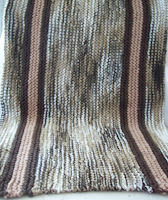 Last night I frogged 2 rows of lace, (the Y shaped scarf) and got 2 more rows knit. (the change is hardly perceptible,so no photo. I've reached the 'split'--the 2 rows were done in two parts. I am holding off, I want to get some work done on UFO's before I start my halloween socks—right now, the 15th (A Week!) is the target start date. Let's see how much progress I can make between now and then! I don't think I will have any difficulty finishing off a pair of socks in 2 weeks.